Pope Leo XI (2 June 1535 – 27 April 1605), born Alessandro Ottaviano de' Medici, was Pope from 1 to 27 April 1605. His pontificate is one of the briefest in history having lasted under a month. 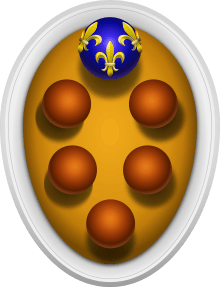 He was from the prominent House of Medici originating from Florence. Alessandro Ottoviano de' Medici was born in Florence as the son of Francesca Salviati and Ottaviano. He was the great-nephew of Pope Leo X. Alessandro's father died when he was a child and he was home schooled by a Dominican priest, Vincenzo Ercolano. Medici felt the call to the priesthood but his mother opposed his vocation since he was the only male in the family. To discourage this, she sent him to the court of the Grand Duke of Tuscany, who knighted him as a knight of San Stefano. He later travelled to Rome in 1560 where he commenced a lifelong friendship and collaboration with Philip Neri, future saint. It was Neri who predicted that he would ascend to the pontificate. Medici's mother died in 1566 at which point he continued his studies to become a priest. This led to his ordination on 22 July 1567. Tomb of Leo XI in St. Peter's Basilica, by Alessandro Algardi. Alessandro served as the Florentine ambassador to Pope Pius V from 1569 to 1584 and was later appointed by Pope Gregory XIII as the Bishop of Pistoia in 1573. In March 1573 after the appointment he received episcopal consecration in Rome. He was later made the Archbishop of Florence in 1574. Medici was elevated into the cardinalate in 1583 and Pope Sixtus V made the Cardinal-Priest of Santi Quirico e Giulitta: a title he received on 9 January 1584. It was a titular church reverted from its previous name of San Ciriaco alle Terme Diocleziane. In the period after this, he would opt for other titular churches. In 1596 Pope Clement VIII sent him as the papal legate to France where Maria de' Medici was queen. He remained there until 1598 when he received word of his appointment as the Prefect of the Congregation of Bishops and Regulars. On 14 March 1605, eleven days after the death of Clement VIII, 62 cardinals entered the conclave. Prominent among the candidates for the papacy were the great historian Cesare Baronius and the famous Jesuit controversialist Robert Bellarmine, future saint. But Pietro Aldobrandini, the leader of the Italian party among the cardinals, allied with the French cardinals and brought about the election of Alessandro against the express wish of King Philip III of Spain. King Henry IV of France is said to have spent 300,000 écus in the promotion of Alessandro's candidacy. On 1 April 1605, Cardinal Alessandro de' Medici was elected as pope. He chose to be called Leo XI in honor of his uncle Pope Leo X. He was crowned on 10 April 1605 by the protodeacon, Cardinal Francesco Sforza and he took possession of the Basilica of Saint John Lateran on 17 April 1605. When he was elected, Leo XI was almost seventy years of age, and he died twenty seven days later. His death came as a result of fatigue and cold in the ceremony of taking possession of the Basilica of St John Lateran. He was called Papa Lampo ("Lightning Pope") because his papacy was so short. 1 2 3 "Pope Leo XI", Catholic Encyclopedia; retrieved 2013-3-15. Matteo Sanfilippo: Leone XI. In: Massimo Bray (ed. ): Enciclopedia dei Papi, Istituto della Enciclopedia Italiana, Vol. 3 (Innocenzo VIII, Giovanni Paolo II), Rome, 2000, OCLC 313581724, pp. 269–277. Herbermann, Charles, ed. (1913). "Pope Leo XI". Catholic Encyclopedia. New York: Robert Appleton Company. Leo XI.. In: Salvador Miranda: The Cardinals of the Holy Roman Church, online at fiu.edu, Website of Florida International University, retrieved 21 November 2011.